Whitetree (Ludovico Einaudi and Ronald & Robert Lippok) could easily fit in amongst all the other Jazz trios in the world, were it not for their special attention to texture and atmosphere. Their CD Cloudland (46'36") presents ten perfectly formed tracks of radiant chamber music. The grand piano at the center of this CD, resoundingly big and beautiful under the hands of Ludovico Einaudi, easily whispers as well the hushed tones of this work's delicate musical message. The group really gets going with building percussion riffs and deep synth basslines charging behind strident piano chords and engaging keyboard flourishes. 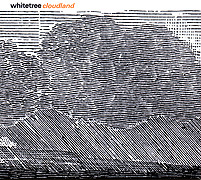 While the pulse quickens at the rapidly passing sonic scenery, it is during the slow parts that the listener experiences the true profundity of music by Whitetree. Playing off clunking electro-rhythms or dense electronic modulations the ever-present piano says more than any synthesizer ever could in its airy, elegant delivery. 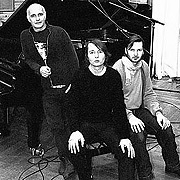 Informed by artists such as Cluster, the Esbjorn Svensson Trio and other genre-bending/blending outfits, Einaudi and the Lippoks bring lyrical lead lines, digital sampling tricks, a lovely classical aesthetic and resonating piano sound together in a moving target under the cool-jazz, new age, electronica headings.